Since I’m busy with a bunch of different projects this week, I thought I’d repost a tutorial I did for Amy‘s Spring Fling series last month. Most of you have probably seen this, in case you haven’t, it’s a super easy and versatile skirt that I’m sure you and your little one will love! Hope you are all having a good start to your week! Spring is something that I am very excited about. I live in San Francisco, so I’m pretty spoiled by mild weather, but the gray and the rain get me down just as much as anyone else. I’m ready for some warm sunny days spent playing outside and going on picnics! So that is what has inspired the project I’m sharing with you today. 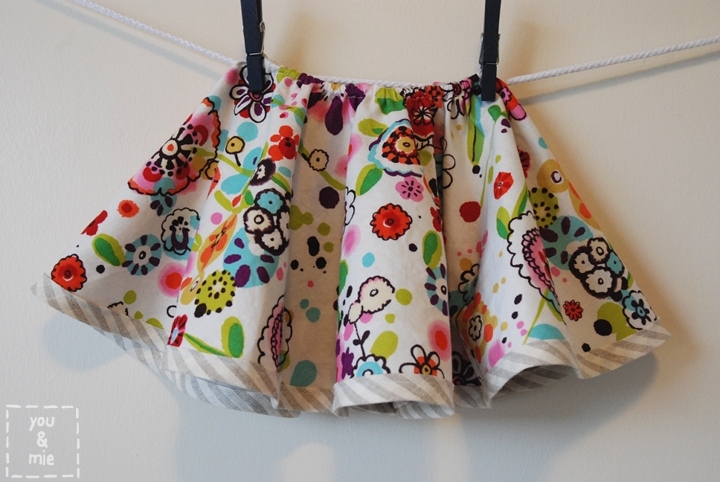 I call this The April Showers Skirt (because, you know, April showers bring May flowers!) and it is a reversible circle skirt. Of course, you can use whatever material you want for yours, but I chose to make one side gray and cloudy and used a bright floral print for the other to represent the changing of the seasons and the sometimes erratic weather patterns of spring. 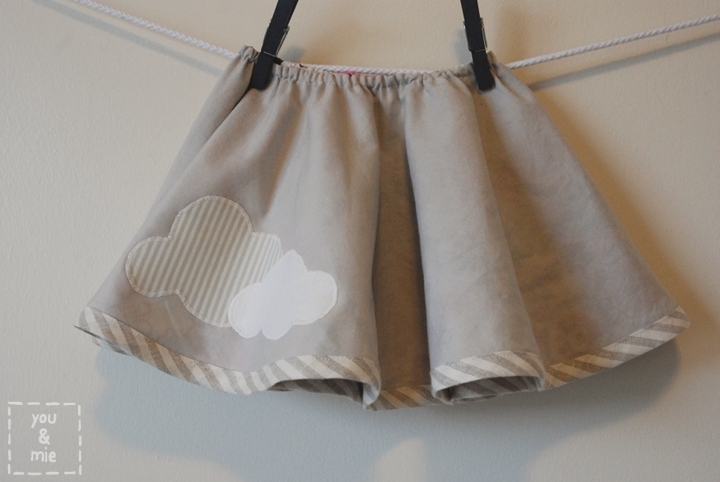 The best thing about this project is, not only is it SUPER simple but, you get 2 skirts in one! 1. Since you are layering two pieces of fabric and adding bias tape for the hem, you want to keep the fabrics lightweight so you don’t weigh it down and it’ll still have that bouncy, twirly effect that circle skirts are famous for. 2. Also, you’ll want a print that looks good from all angles since that’s how the fabric is going to lay. If you pick something that has a clear up and down, your print will appear upside down on one side of the skirt (and sideways in other parts of the skirt). 3. Lastly, when choosing fabrics, hold them up against each other to see if one will show through. Since I picked a light gray and a bold print, you can see a little bit of the print from the gray side, but I was ok with it. 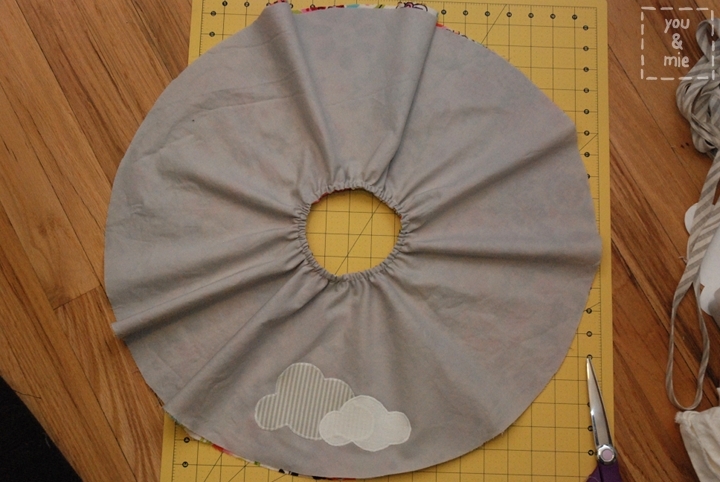 To begin, you’re going to need to know how to make a circle skirt. 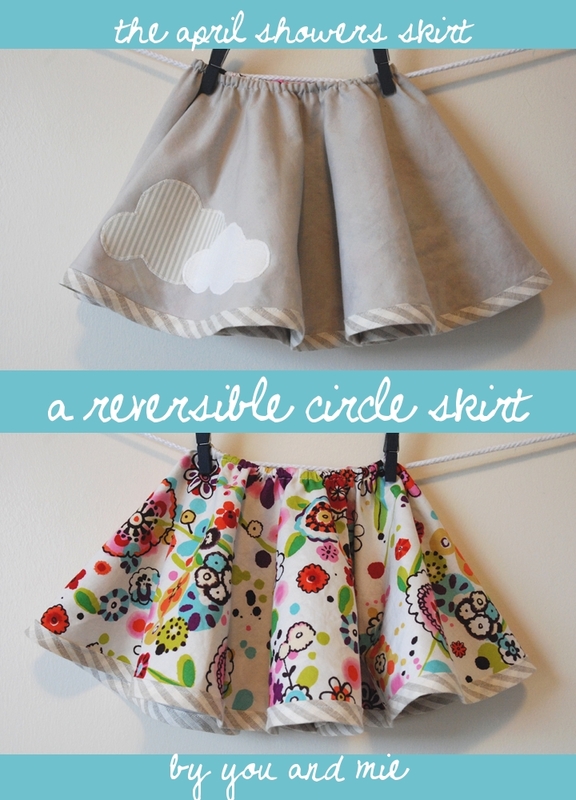 I used this awesome circle skirt tutorial from made to help me figure out how to make my circle skirt pattern. You’re going to need the waist measurement and the desired length of skirt and a little bit of math to make this pattern, but Dana did a fabulous job of breaking it down, so go over there and make your pattern and then come back here! 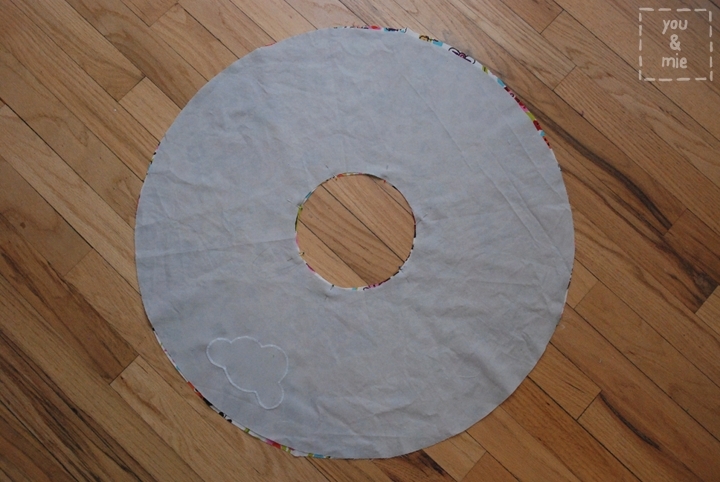 Ok, so now that you have your custom circle skirt pattern, fold both of your fabrics into fourths and cut out your circle. This is what it should look like when they are still folded. If you unfold them, they should look like donuts. If you’re going to add applique, which is optional, now is the time to do it. 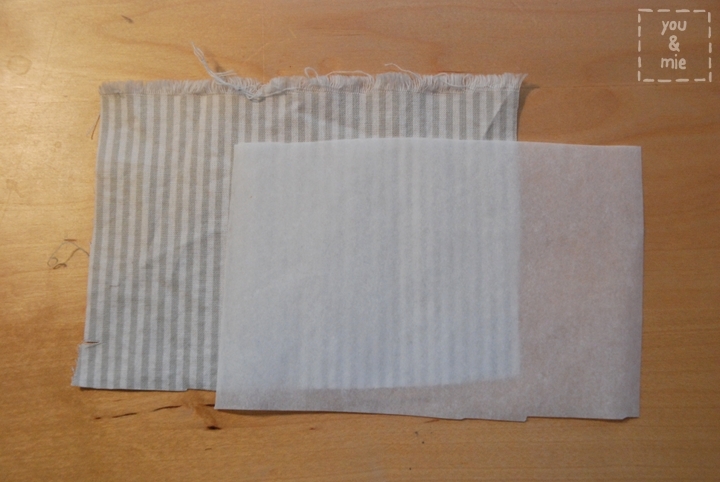 Cut your scrap of fabric to the approximate size you’ll need and then cut your fusible web slightly smaller than that. Follow the directions that are specific to the fusible web you have. The one I use most often is Pellon Wonder Under and I love it. It has a rough side and a paper backed side. 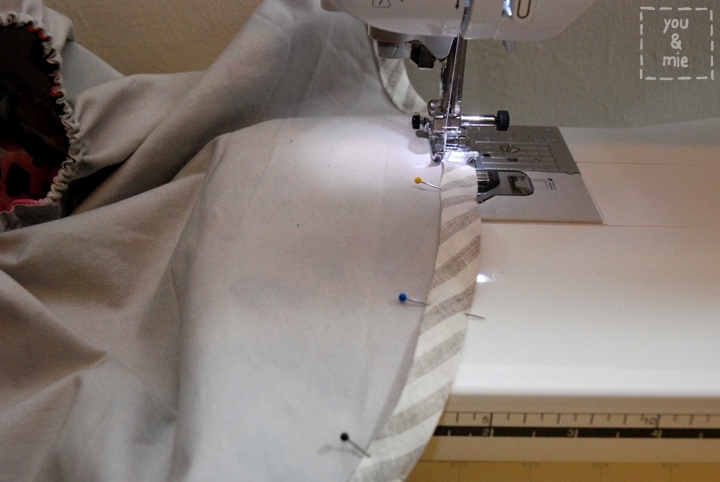 Place the rough side down on the wrong side of the fabric and iron it on. Now draw your design on the paper side and remember to flip your image since you are drawing on the wrong side of your fabric. Cut it out, place it on the skirt where you want it to go (at this point, there is no front or back to the circle skirt, so you can put it wherever you want). 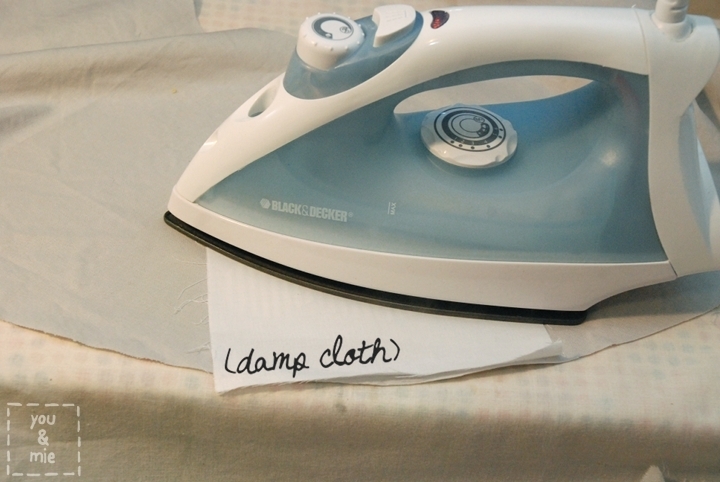 Cover it with a damp cloth and iron it on. It should be nice and adhered, but I always zig zag stitch around my entire applique to make sure it stays put! 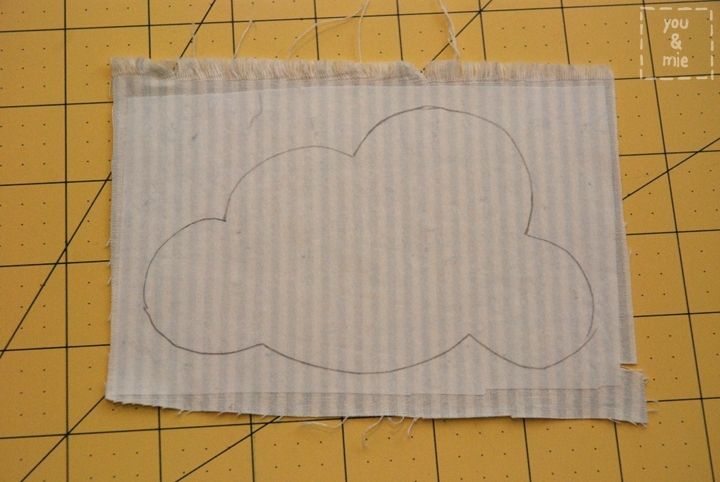 Repeat with any other appliques you want to add to either side of the skirt (I decided to add the second cloud later, but I should have done it all at once). Now to sew the two sides together, place them on top of each other right sides together. Pin the inner circle together and sew all the way around. 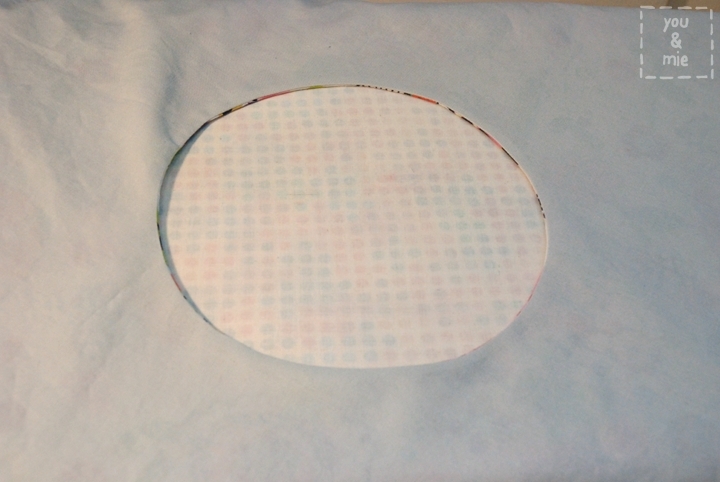 Take one layer of the skirt and push it through the center of the circle turning it right side out. Press. Now we’re going to make the elastic casing by top stitching another circle around the waist leaving an opening to insert the elastic through. Make sure your casing is slightly larger than the width of the elastic you’ll be using. To insert the elastic, separate the two layers and find the opening that you left. Attach a safety pin to one end of your elastic, and push it all the way around the circle back to the opening. Sorry, I didn’t photograph this part, but take both ends of the elastic and sew them together, trim the extra off and sew the opening shut. We’re almost done! 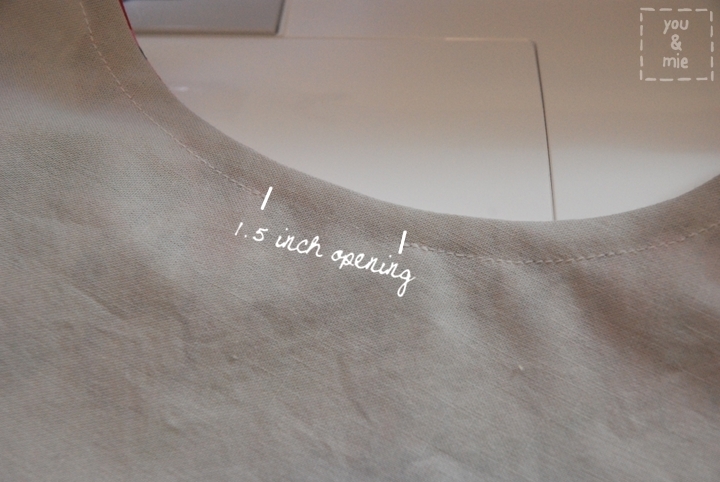 (At this point, you can measure the length and trim off extra fabric if necessary). 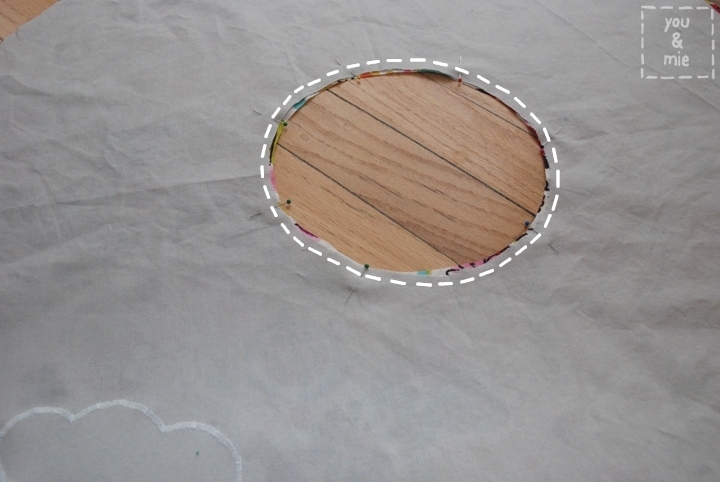 Pin your bias tape around the outside of the circle. Leave a few inches of bias tape at the beginning unsewn, then top stitch all the way around. 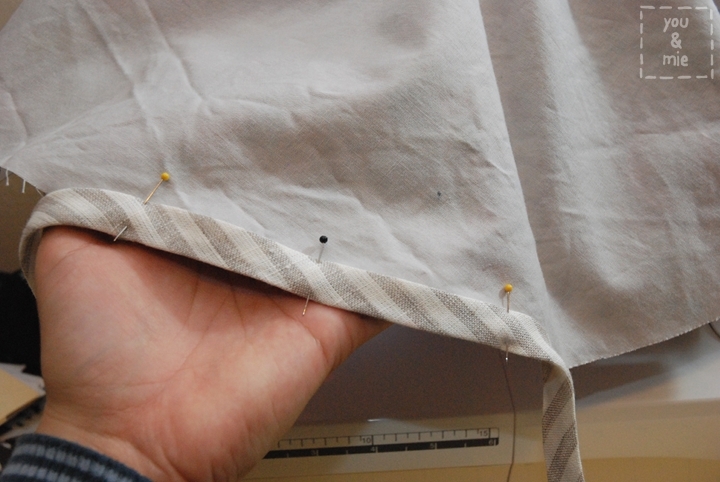 When you get back to the beginning, you should be able to measure out where the bias tape needs to be sewn together. 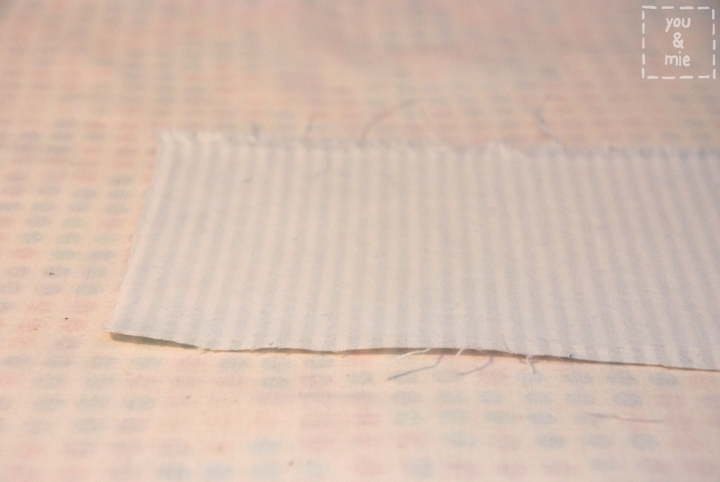 Sew the two ends of the bias tape with the right sides together. Press open and then finish top stitching the bias tape on. 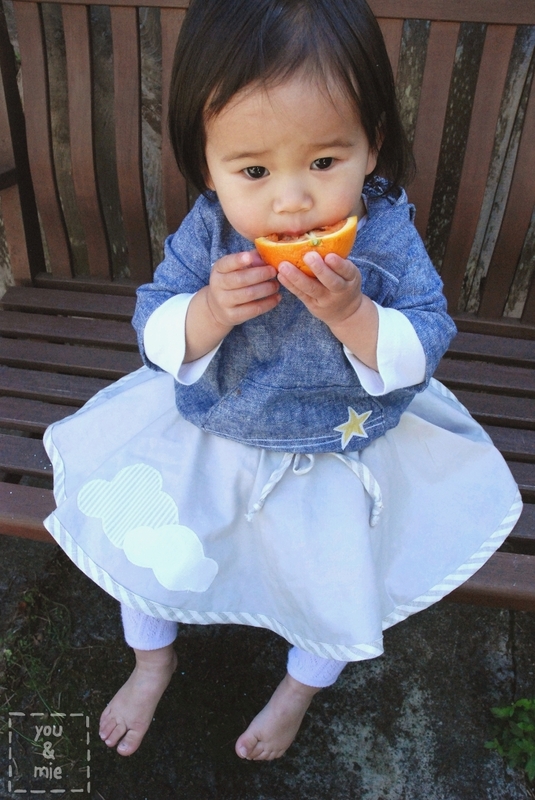 Now your little one has two skirts to skip around in during the upcoming spring months! I love both sides, but I think it’s extra fun to catch a peek of the colorful flowers on the underside of the gray. So fun! Oh and don’t forget, if you make a skirt using this tutorial (or any tutorial or project on this site), I’d love to see it! Just add it to the you & mie flickr pool!! 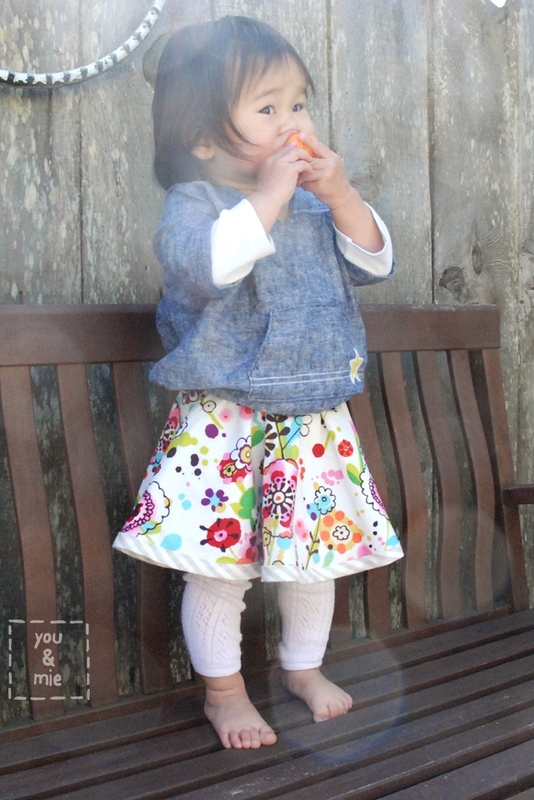 This entry was posted in tutorials and tagged circle skirt, girls, reversible circle skirt, skirt, spring, tutorial by Cherie. Bookmark the permalink. Just so cute! The skirt and your model! 🙂 Did you make the hoody as well? If so…..tutorial please! Love your posts, keep them coming! Thank you! I did make the hooded pullover and I’ve been meaning to do a tutorial for awhile. I can’t make any promises as to when, but I’ll definitely try!! i just love this skirt. reversible is twice the fun! Super adorable skirt (the color combo is beautiful!). But I have to ask about those leggings, I’ve wanted something like that forever… where are they from?? Thanks! They were a gift and I think from Japan 😦 Sorry! 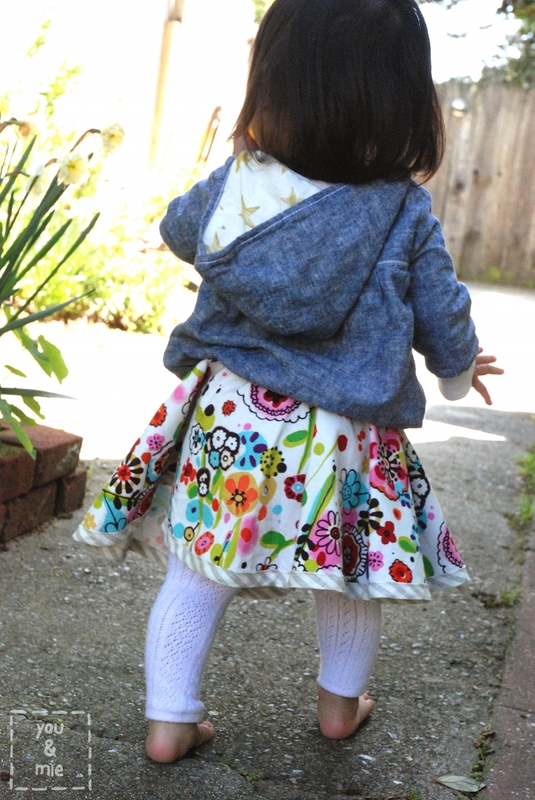 love this skirt…… really love the “bright floral print ” what fabric is it? where can i get some? I’m so bad at paying attention to what fabrics I’m using! But I looked it up and it’s called Larkspur L7423 Z Meadow Brite Cotton Lawn by Alexander Henry. I bought it at a fabric/quilting shop here in SF, but I’m guessing if you search you can find it for sale online too. Good luck! This is so cute! I think I may have to make one for myself! 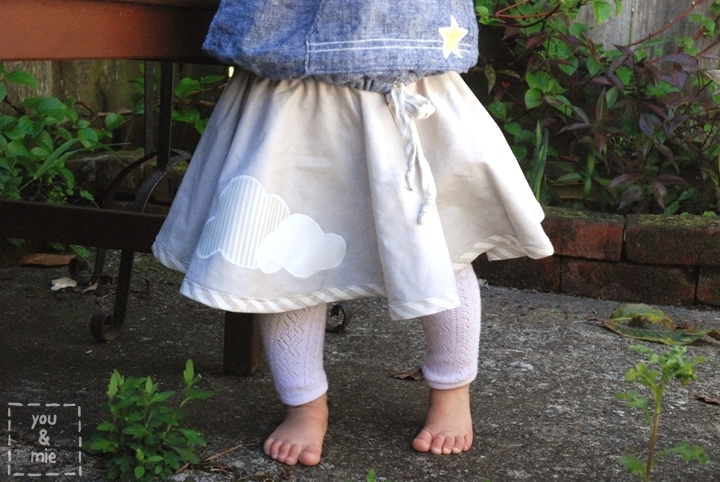 I love anything reversible, for little ones….the more choices the merrier. Great tute. Thanks for sharing. Your little one is beautiful and has such a happy smile!!!!! Wow that is so cute . I love it ! This looks so cute and simple! Can’t wait to try it out! Just came across your blog via Pinterest (thisheartofmine.com) thank you for the tutorial! Love the skirt and the cute model. Question.. Did you make the bias or purchase? I am toying with purchasing one of those metal things that help you make it but not sure (Clover brand) if it is worth the trouble. It does give a really nice finish. Hi Katy! This particular bias was purchased. I have made my own before and I do NOT own one of those tools that helps you fold while you press, but I am seriously considering getting one too. From what I’ve seen on other blogs, they are highly recommended and seem like they’d make the process much easier and faster. And you can definitely get cuter bias if you make it yourself with all the awesome fabrics out there vs. the sad selection of premade bias. Anyways, good luck! Absolutely love this skirt! Might make one for my baby daughter. Cute skirt! Is there another way to do this without adding the bias tape? 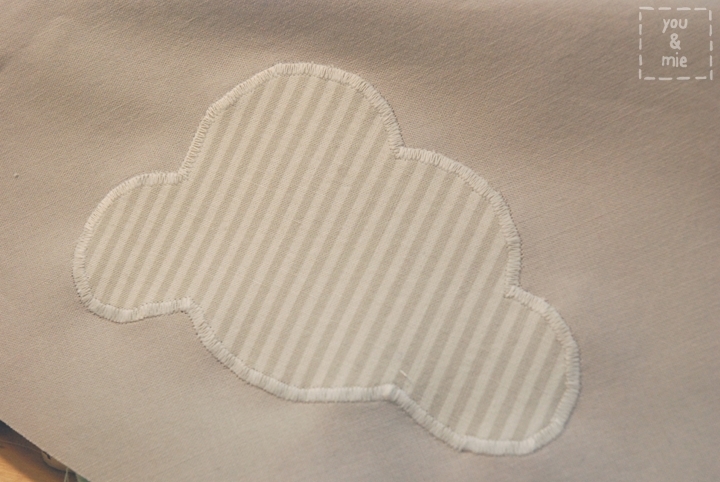 You could hem the layers separately? 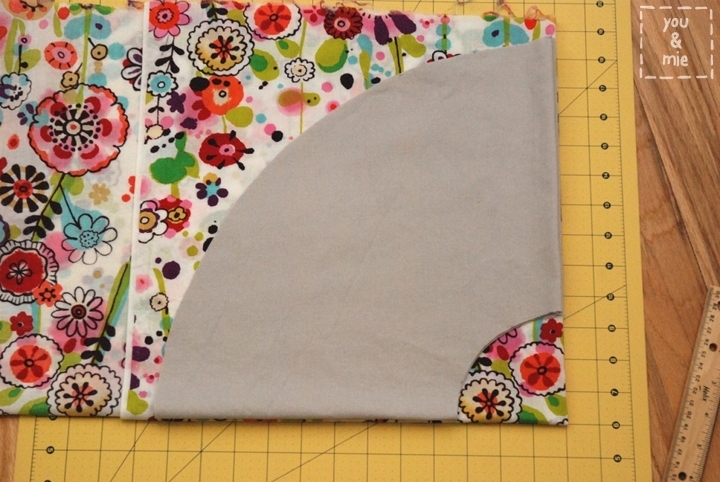 Can anyone help me out with the bias tape for the hem part? 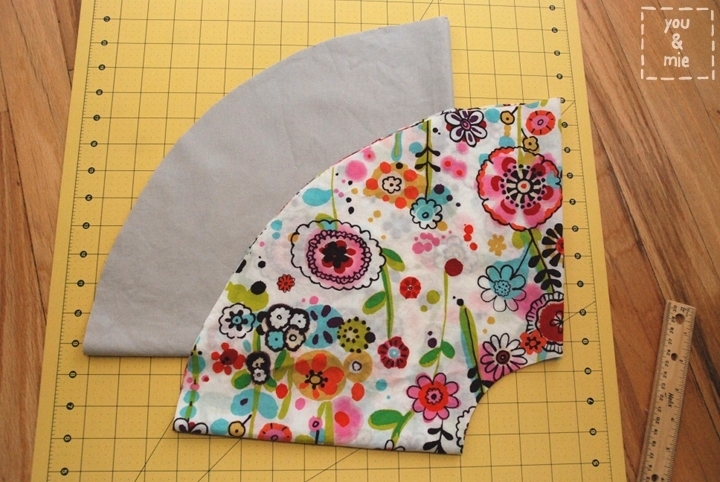 Do you sew the bias tape separately on the top of each layer of the skirt? Do you fold it under to catch both layers of the skirt. I am confused. Ooh, good question! There are a couple of ways that you can attach the bias tape, but looking back at my tutorial, it looks like I used double fold bias tape and with the two layers of the skirt together and lined up, I basically sandwiched the the two layers between the bias tape and top stitched all the way around. You can also open up the folds of the bias tape and line up one of the raw edges with the raw edges of the skirt layers and sew along the fold. 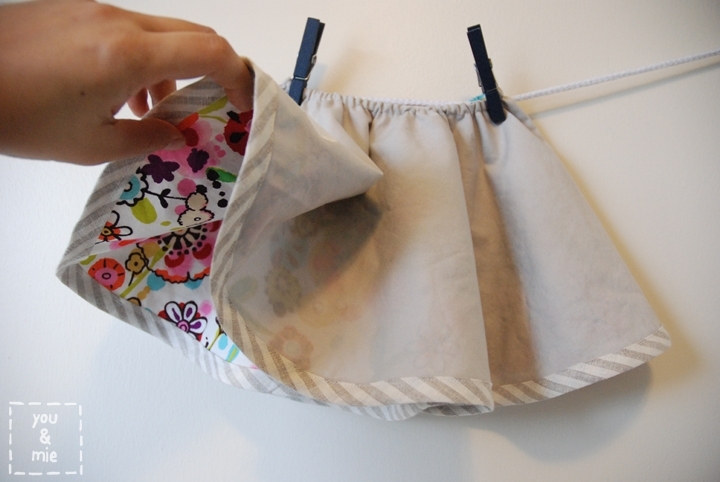 Then you fold the bias tape down and over the edge of the skirt to the other side. Then you top stitch around to finish. Does this help or make sense? There are tons of tutorials and videos out there as well if you need some visuals! Good luck! Wow! This is a great idea! I am going to make it for my little one. Thank you!!! I usually take the waist measurement and cut the elastic to that length. Then I overlap the elastic by 1 inch to sew it together and that makes the waistband snug on their waist, and not too loose. 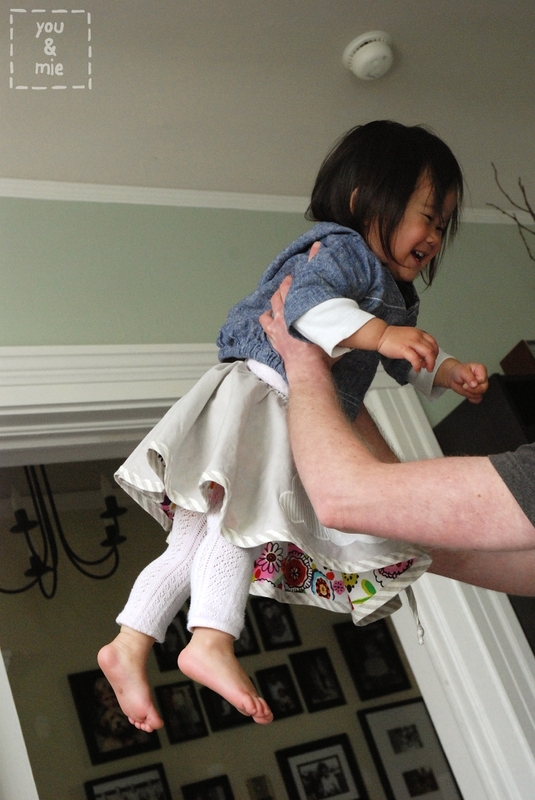 But really, it’s best if you can measure the elastic on the kid and mark where it is comfortably snug. Hope that makes sense. It seems (on the pictures) that you did not use an elastic for the waist but a ribbon with a knot so when she grows up the skirt will still fit. Is it right ? Or would it be possible ? Hi! this is pretty! Im trying to do this skirt, but i have a problem: When i try to sew the case elastic part, the skirt gets ugly wrinkles, and in your photo looks perfect. Can you help me, please???? Hmm . . . that’s weird – I’m not really sure, honestly! It might have something to do with the fabric you’re using? Or maybe if the elastic is pulling the fabric too tightly in, it starts wrinkling? I’m sorry, I wish I could be more helpful! Let me know if you figure it out! 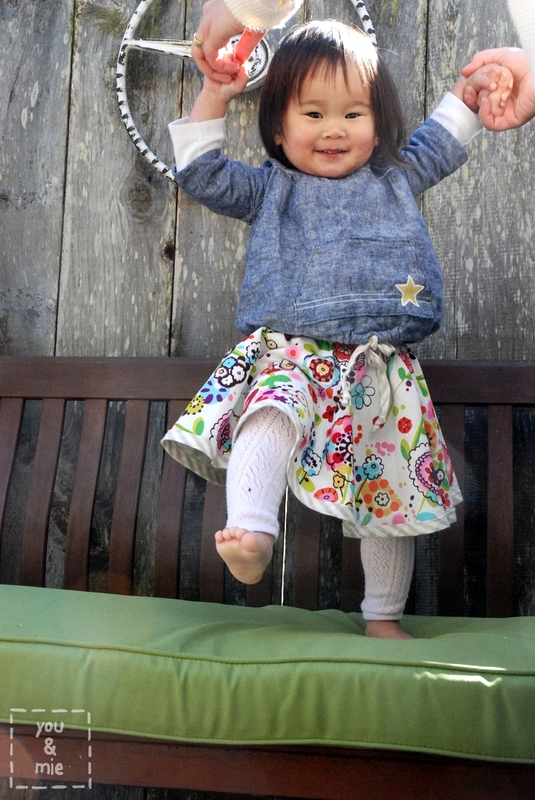 Pingback: Girls’ Skirt Tutorial Roundup! I’ve been eyeing this skirt for some years now. Can these be easily conformed to an adult version?